When criminals are brought before judges for sentencing, judges should weigh factors including the severity of the crime, public safety, losses to the victims and their family and a defendant’s efforts to change. But all too often judges hand down light sentences to repeat offenders who often go on to commit even more violent crimes. Marcus Wheeler had a criminal record dating back to 2008 and on May 20, 2015 officer Kerrie Orozco was shot and killed by Wheeler who was being served a warrant by the Omaha police department’s Fugitive Task Force. Officer Orozco left behind a husband and his two children as well as their newborn baby. The woman who was an accomplice in Kerrie Orozco’s murder by purchasing the gun for Wheeler, was sentenced by an Alabama judge to only probation! Eswin Mejia was driving with a suspended license and was in the country illegally when he crashed into an SUV, killing 21-year-old Sarah Root. Mejia was street racing and driving drunk before crashing into the back of Sara’s SUV. Police say his blood-alcohol level was more than three times the legal limit when he was street racing near 33rd and L streets. The loss has left Sarah Root’s friends and family with profound grief. To make matters worse, Mejia was scheduled for a preliminary hearing, but never made it to court after the judge set Mejia’s bond at only $50,000! The judge revoked Mejia’s $50,000 bond when he failed to appear after a relative posted a $5,000.00 cash bond. Cases like this happen all too often. And as disturbing as cases like these are, it has become even more common for judges to hand down probation to those convicted of sexual child abuse. Research conducted by the Centers for Disease Control estimates that approximately 1 in 6 boys and 1 in 4 girls are sexually abused in their own homes by family members, step-parents or caregivers! In 2014, state agencies identified an estimated 1,580 children who died as a result of abuse and neglect. That’s between four and five children a day—roughly ¼ of your child’s elementary school class! Sadly, only a fraction of convicted perpetrators of physical or sexual abuse of a child are sentenced to jail. Most of those convicted of child abuse are only sentenced to probation! A judge must run for retention in office in the first general election that occurs more than three years after his or her appointment, and every six years thereafter. 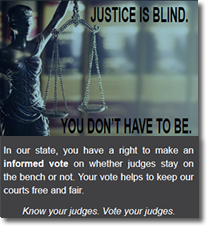 When a judge runs for retention in office, the question presented on the voters’ ballots states: “Shall Judge ___________ be retained in office?” If there are more votes to retain a judge than to remove him or her, then the judge remains on the bench for an additional six years! We can send a strong message to these lenient judges by voting “NO” to retain judges.